Introducing 3D-180 Video on Facebook. Since 360 video was introduced to Facebook in 2015, It has given creators, publishers, advertisers and regular Facebook users an opportunity to creatively use this format to create really interesting and unique content. 360 video creates an experience for the viewer that makes them feel like they are really there in the moment, but it’s not the only way to share a video that gives this experience. 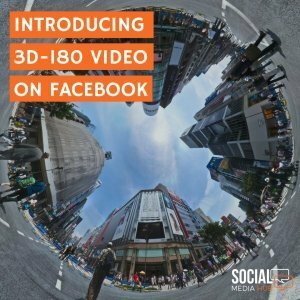 Facebook have recently introduced another great format to produce immersive content with 3D-180 Video. 3D-180 videos give the viewer a full 180-degree-wide-angle view in News feed, and gain extra dimension with 3D depth when viewed in VR. 3D-180 videos are easy to shoot, giving creators control over framing and eliminating the challenge of stitching. This will enable you to think about scenes that naturally work best in 180 degrees by allowing you to determine the exact frame you want to capture and share – such as when you’re filming a live event like a football game, concert, recording a cooking show or even shooting a documentary. Once the correct file type is attached, you’ll be able to share your video directly to the Facebook timeline where your audience can view the video as a 180 video on the timeline, or for the ultimate viewing experience, watch it as a stereoscopic 180 video in VR, through the Facebook 360 app for Oculus Go and Samsung Gear VR. 3D-180 Video will also support spatial audio and Live 3D-180 videos so you can capture immersive audio with your video, and capture moments just as they happen with Facebook Live. For step by step instructions on uploading and sharing your 3D-180 videos, Contact Us for advice or a free social media audit. We look forward to seeing the great content you create for your audiences! Selling Products on Instagram What is IGTV? and How do I use it?